I truly believe that kittens are God's apology to human-kind for making spiders. I sit here with Sissy's newest litter climbing my pant legs, their tiny claws digging into flesh, making me cringe. But I don't mind, they are having a ball, tiny fluffs of fur bobbling around, learning to love life. Their little eyes are still blue they are so new. And Sissy sits close by, observing the antics and occasionally mewing softly to keep her brood in line. I finally pull myself away as the little family huddles together once more. Mommy cat flops down on her side and her kittens begin to battle for feeding rights. I hear them fussing as I climb backwards, down the steps of the ladder to the lower level of the old hand-hewn barn and I glance in the stall where our mare is nursing her new foal. Sometimes life can be so beautiful as to be overwhelming. And on these days, I am filled with gratitude and joy. I go about vigorously raking the left over leaves from last fall as the temperature rises quickly, helping the daffodils, crocus and buds on the trees emerge in search of the springtime sun. But in the distance, the ominous sound of thunder rumbles faintly, then again, much louder. On the noon news, the weather forecast called for a chance of severe weather and I throw myself into the raking and chores so I can saddle my horse and ride a while before dark. A bank of clouds accumulates quickly to the southwest in angry shades of dark blue and green; I begin to grab the clothes off the line as a chilly gust of wind tells me the storm is moving in fast. Out of the corner of my eye, I notice my old gelding high-tailing it to his shed too. A sure sign of bad weather. Suddenly, the wind begins to howl like a banshee and I don't have time to move, let alone get my clothes inside. And out of the wall cloud, a snake-like shape twists and spins right at me, its silvery length mezmerizing and terrifying. I stand, unable to run as the devil's top sweeps my world away. 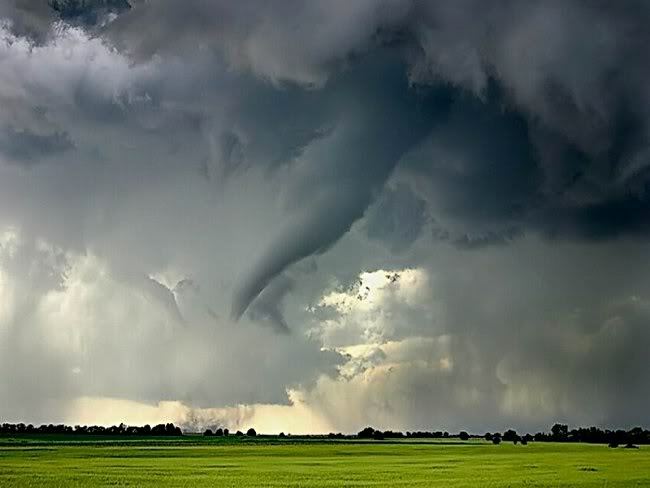 Springtime is the best, until tornadoes strike, then people lose everything in an instant, sometimes even their lives. I am thankful for every day. Good or bad. Well, not always the bad. Thank you for reading and to photobucket.com for the loan of this neat photo! © Copyright 2019. Realist101 All rights reserved. Realist101 has granted FanStory.com, its affiliates and its syndicates non-exclusive rights to display this work.